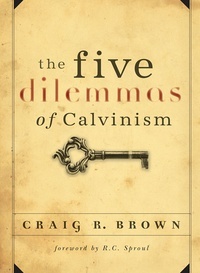 After a brief survey of the historical development of the theological school now known as Calvinism and a comparison of Calvinism and Arminianism, Brown turns to a consideration of five dilemmas that Arminians typically associate with Reformed doctrines. The author then attempts to demonstrate that these “problems” are largely misunderstandings of Calvinism. Written in a winsome and engaging style, Brown’s work is an excellent primer on Calvinism and some of the critiques that have been leveled against it. As such, the book provides both apologetic help for Calvinists and answers for Arminians with honest questions. These writings are helpful. If we could figure out His secrets He would not be very awsome. I think it is wonderful that we can study and meditate and sometimes get some of His mysteries shown to us...but then we start getting glimpes of other even deeper things of His mind!! I was not very impressed with this book as it seemed to me to lack some unity and some possible imprecision. Do all babies who die go to Heaven? I would tend to say-all elect babies. Does a God who is all-knowing base election on an "untimely" death? I have read through this book twice now, and am currently using it to teach my Sunday school class. Craig Brown has written clearly on several very difficult doctrines in an easily understandable fashion. I am gladly handing this out as a resource, and am grateful to be teaching through it. Most importantly, Brown lays a Scriptural foundation in each chapter that is irrefutable and contextually accurate. For all who have ever denied Calvinism, this is a great book to set the record straight on some of the most common misconceptions in the church today. I thought this book gave a clear and concise explanation of Calvinism and why it most closely adheres to the Scriptures. That said, as a pastor of a church in a highly reformed community, I'm not sure it will help those who were "burned out" or have a negative view of Reformed Theology. I was hoping this book would be a little more sympathetic to that specific type of people group; however, there were some sarcastic remarks that I thought unhelpful (ex: the daisy comment). While I think it's creative/funny, it might not help with an uninformed, so-called, arminian. That said, the book will prove to be helpful to me with all of the Scripture passages. And, while I know there could be some disagreement on the final dilemma (babies), I found that to be one of the most insightful chapters - again, because of all the Scripture references to back up the statements. To attempt to excuse Calvinsism as a doctorine because it is difficult to understand is counterintuitive at best and ridiculous at its worst. To set aside an elect group who would be deserving of Christ's Salvation and to send to eternal damnation those who had no choice or ability to be saved is beyond belief. Calvin, a man whose only claim to salvation was infant baptism, spent his life murdering in horrible ways those who simply wanted to choose their Baptism as adults. Can anyone really believe that his ideas were from a loving God who loved us so much that He sent His only Son to die on the Cross for all of our sins? I cannot. My initial criticism is that Calvinists seem to find it necessary to dismiss the entire 1300 year period from Constantine to Luther as though there were no theologians or commentators worthy of study during this period. Two such writers that I would commend to you would be St. Bonaventure and St. Bernard. Admittedly, there were aspects of the Church's growth during the middle ages that may be an appropriate subject of criticism. But remember, the model of government prior to that time was the brutal Roman Empire. With this perspective, the perceived need in the Middle Ages for the Church to guide government away from the pagan model is understandable. There are always aspects of Chrisitianity that fall short in advancing the purposes of evangelism and holiness. The 17th century and beyond are not expamples of perfect piety. Notwithstanding the shortcomings, the period in Eurpoe from the 4th Century through the 16th Century is one of the most amazing 1200 year periods in human history, and the achievements and advances during that period are in no small part due to the faith and love of the people. Reformation, reconciliation, and response to God are certainly hallmarks of the Christian life. It is easy for us now, at our leisure in this 21st century, to find these movements lacking in the Church from the 4th Century onward. But these early centuries do offer many examples of holiness for Christians to learn from today. Is God sovereign or am I? What a great book to help me put the right words in the right order for explaining the truth of scripture to those who are believers and to those who are seeking Jesus the Christ that it is God almighty who is sovereign above all and not us (man). Craig Brown's easy reading but powerfully in-depth book serves to open one's mind to a true understanding of God's grace upon a spiritually 'dead' sinner utterly lost in his fallen nature totally and helplessly incapable of giving birth to anything except more sin. I now know without a doubt that throughout Holy Scripture from the beginning that it is God almighty who chooses us to believe, however, He does not believe for us, we still must believe! But, we are assured that we whom He has chosen will believe! His remnant, His elect! (John 6) 37 All that the Father gives Me will come to Me, and the one who comes to Me I will by no means cast out. 39 This is the will of the Father who sent Me, that of all He has given Me I should lose nothing, but should raise it up at the last day. Grace becomes totally embraceable and I am assured that He will never leave me nor forsake me because it was He who regenerated me from spiritual death. I know now that it is the rebirth caused by the good pleasure of His will that produced the faith I now have in Christ. There are so many who are lost in their thinking that it was they who took the first step in choosing Christ that caused God to count them righteous and just and saved. It's no wonder that so many live in doubt of their salvation. I've heard it said that God is a gentleman and will never interfere with man's free will. I now wonder what god that is? I'm sure now because of this book that it is not the God of Holy Scripture. For God did not wait for anyone whom He chose to acquiesce to His will, neither Abraham, nor Moses, Nor Isaac, nor Jacob, nor David, nor Paul nor the person writing with review. He chose me to believe, and I believed. He did not believe for me, but rather planted the faith in me that caused me to believe. Praises to Him! I applaud the book for it's simplicity. This is a great book to give someone who is just beginning to delve into this subject. Thanks to Ligonier for it's committment to publishing/selling excellent works such as this. The problem with many books that "skim over" a subject matter that is viewed as a deep, controversial topic is that they give just enough information to confuse you and not enough information to thoroughly teach you. As someone who subscribes to Reformed theological doctrine I thought this book was OK...if you are someone who may be just considering Calvinism or Reformed doctrine for the first time. If you are already staunchly rooted in Calvinism this book will most likely be of little help to you; however, it may be a great book to give to one of your friends who is contemplating Reformed theology. The brief history in the beginning was good. Most of the book was OK but for some reason I thought the chapter on dilemma five was weak. It is riddled with opinion. Granted, it deals with difficult subject matter that the Bible deals minimally with but I still found myself being uneasy adopting all of the author's views as "gospel"
It has confused me more than helped. Are there only two persuasions in this world - reformed and arminian? My training, many years ago, was at Moody Bible Institute and I don't remember hearing these terms. No scripture was given for the arminian position and I think that is unfair. I don't think the matter of predestination and free will can ever be completely explained. God says the secret things belong to Him. So why do Calvinists think they can explain it? This doctrine troubles me greatly and I had hoped to get help from this book - but not so.